RStudio offers a variety of free and paid plans for shinyapps.io that can accommodate all budgets with a flexible monthly or yearly subscription. 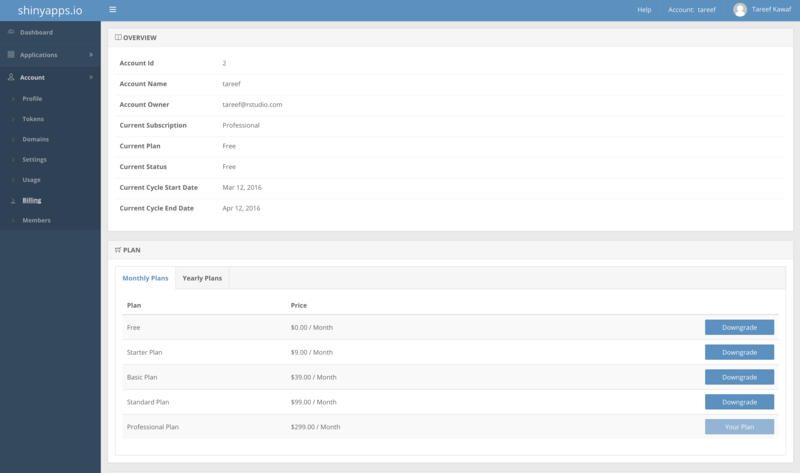 Information related to billing and invoicing is available within the Account -> Billing page in the shinyapps.io dashboard. All plans are payable by credit card only. If your organization has a requirement for invoices, we offer an option for the Professional plan only that includes a premium to accommodate the overhead associated with contracts, renewals and invoicing. To inquire about this option, please send an email to sales@rstudio.com. All subscriptions auto-renew at the end of the subscription cycle. If you would to like subscribe for only one month or one year, you will need to cancel your subscription prior to the start of the next cycle. There are five plans available, and all paid plans are offered on a monthly or annual basis. The annual plans provide a discount over the 12-month rate, if you know you would like to use shinyapps.io for the whole year. Payments are collected on a monthly or annual basis, depending on the plan that is being used. The billing cycle starts at the time you sign up for a paid plan. You can see the current cycle start date on the Account -> Billing page. A detailed PDF invoice is available for download on the Account -> Billing page. An account can be upgraded or downgraded at any time. To change your plan, visit the dashboard under Account -> Billing, scroll to the Plan section, and select the plan you prefer. Upgrades take effect immediately; however, the charge for an upgrade within two paid plans will take effect at the beginning of the new subscription cycle. Any unused days or months in your current plan will automatically be credited against your new plan. Please note that at this time cancellations take effect immediately and the entitlements in the subscription cycle do not continue until the end of the subscription cycle. In addition, there are no partial refunds. You can change the name of your account, or transfer ownership of the account from one email address another, by visiting the Account -> Settings page in the dashboard. To change the name of the account, click the Rename button within the Account -> Settings page. You can select from any name that is not already taken. See section 2.2 for information on allowed names. Important Note: renaming an account will change the URLs for all the applications within your account, which will result in an error when a user attempts to access applications via the old URL. To transfer the account ownership from the current user to another, click on the Transfer Account button within the Account -> Settings page. You can transfer the account to any user registered on shinyapps.io. The user does not necessarily have to have a full account on the service; they may be a shinyapps.io user that was invited to access a private application, for example. Important Note: Transfering accounts is immediate; once you transfer ownership of the account, you will no longer have access to it. 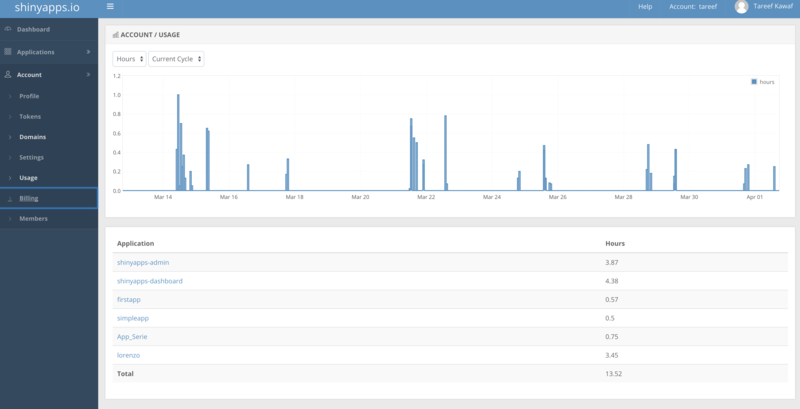 The Account -> Usage view within the shinyapps.io administrative interface provides the metrics for the usage of all your applications over various time periods. The default view displays the usage within the current billing cycle; however, you can change the range to 1 Day, 1 Week, 1 Month or 3 Months. To read more about metrics, please see the sections on account and application metrics. You can view the usage of your applications within your account by visiting the shinyapps.io dashboard and clicking on Usage under the Account tab.